Haut du Lièvre is a model of one of the biggest constructions in Europe. Built by Bernard Zherfuss ,in 1959, the «Cedre Bleu» is a housing block built for the site called «le Haut du Lièvre» in the suburbs of Nancy in France.The block was nearly four hundred meters long, and included nearly one thousand flats. In 2010, two hundred and fifty meters of the blocks were cut out in the frame in of an architectural rehabilitation. Between a wreck and a utopian enclave, the model floats like an anachronistic object, evoking Robert Silverberg’s book entitled the World inside and Shivers by David Cronenberg. The model was built in his original format (including common tumble dryers at his roof) using the H.O scale (1/87) traditionally used for miniature trains. 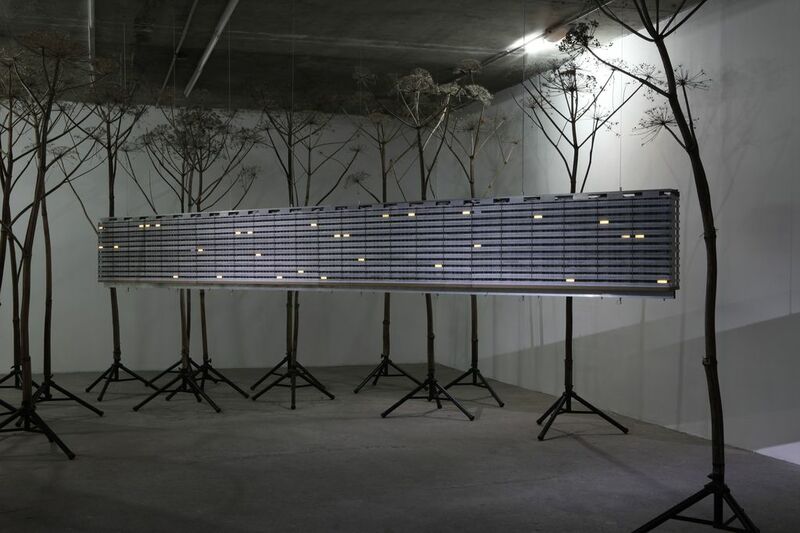 The model is animated by LED lights on its façades that reproducing the animation of a living building. Suspended with cables, the model seems torn from the ground to become an iconic of an architectural gesture referring to Post-World War II aesthetics and to socialism.